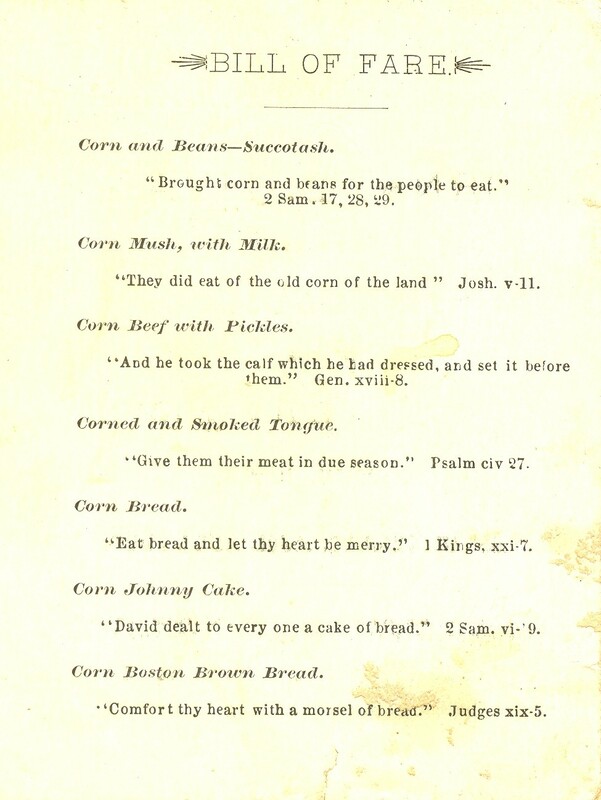 Regional traditions and personal preferences influenced how the corn dishes were prepared. While green corn and popped corn required minimal effort, other dishes entailed much more work. 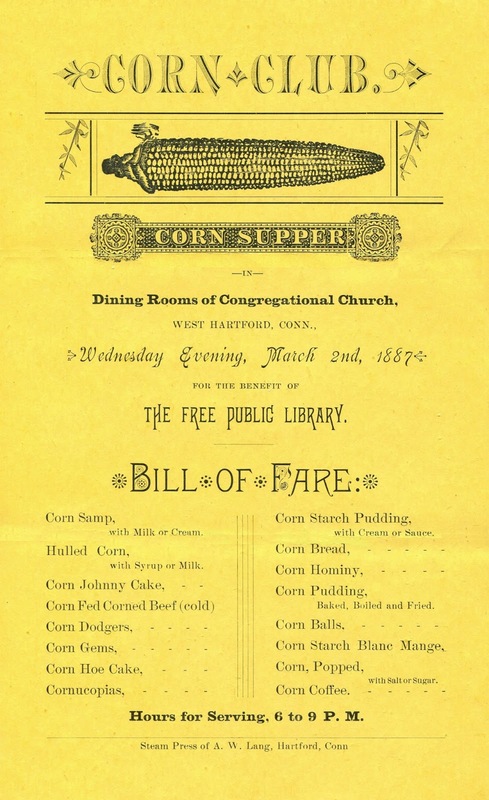 Hulled corn—described in 1890 as an “old-fashioned luxury” when prepared by the traditional process—was made by seeping corn in hot water and lye to loosen the hulls and remove the germs. The hulls were then soaked several times in fresh water to remove the lye, and finally boiled until soft.3 Hulled corn was eaten with milk, or butter and sugar. It was also ground down to produce samp, hominy, and corn mush. There was corn bread, of course, as well as corn gems, made with equal parts cornmeal and flour, and cooked in the small pockets of a gem pan. 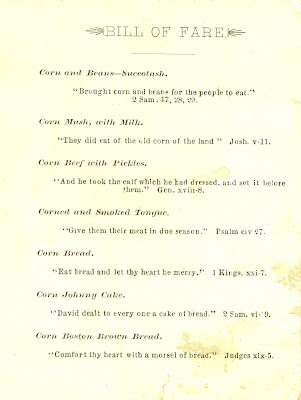 Corn johnny cake was a simple flatbread made from cornmeal, water, salt and sometimes sugar or molasses. The same ingredients were also shaped into small oval cakes and baked (or deep-fried like a hush puppy) to produce corn dodgers. 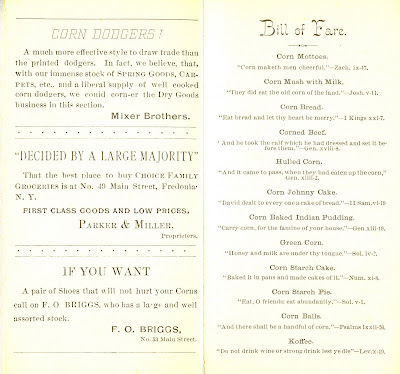 Corn balls, one-inch balls made with whole grains, were also fried. Corn hoe cakes, also known as ash cakes or cornpone in the South, were originally baked on a hoe over a campfire in the fields. Desserts with unappealing names like corn starch pudding, corn starch cake, and corn starch pie probably tasted better than they sounded. Indian pudding, made from cornmeal, milk, molasses, and spices, was a common dish throughout the century. 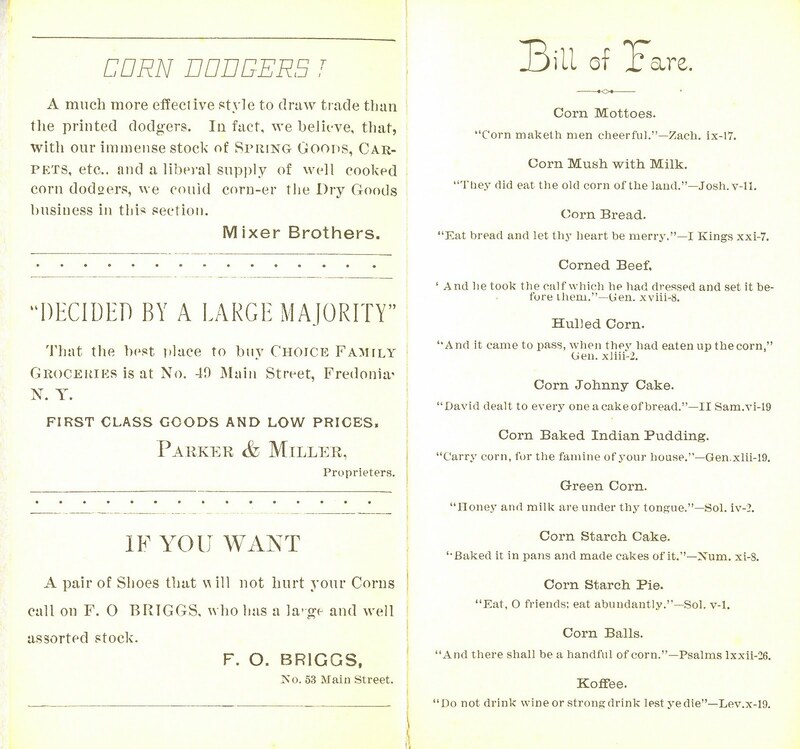 Candy corn would have made an easy addition to these menus, but the new confectionery made in Philadelphia was not widely distributed in the 1880s. Corn coffee and “koffee” were most likely plain coffee. The corn fad did not last long. By the early 1890s, church suppers were being promoted as “Old Tyme Suppers” with the bill of fare written in Old English, reminiscent of the menus that were in vogue during the Centennial celebrations in 1876. 1. Seed catalogs contained jokes and anecdotes among the product listings in the late nineteenth century. 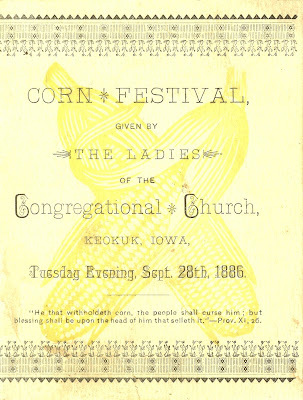 The genre came to be known among farmers as corn catalog jokes or corn jokes. 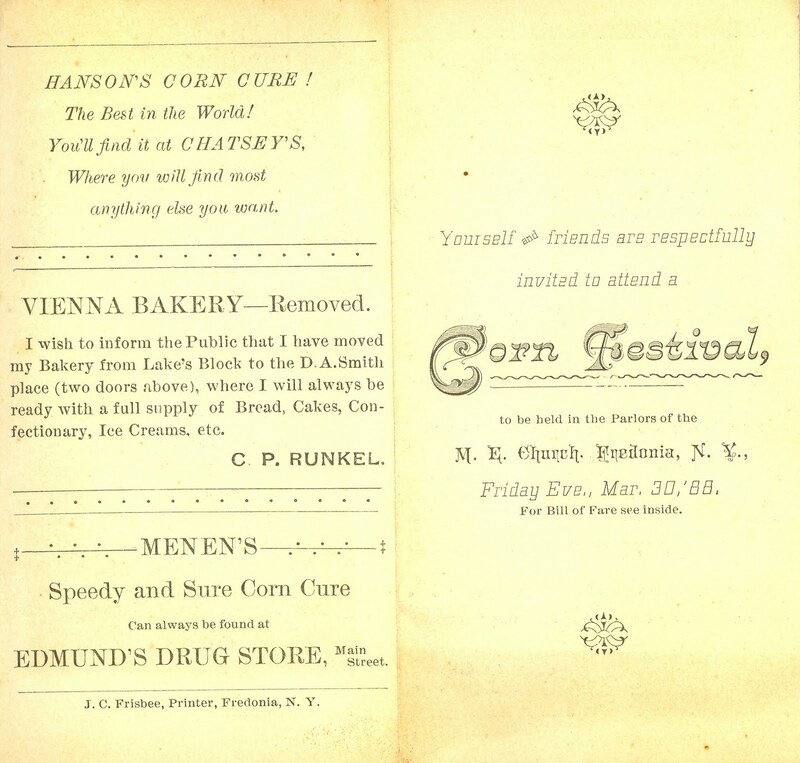 The term “corny” was reportedly first used by jazz musicians and jazz writers in the late 1920s. 2. 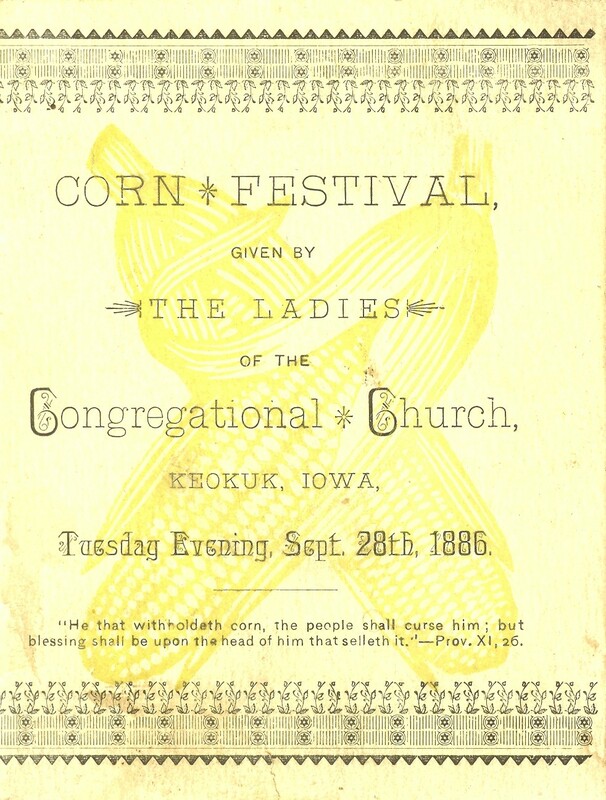 The menu from the Congressional Church of Keokuk, Iowa is a fragment, having separated at the fold with only the first half of the menu surviving. 3. 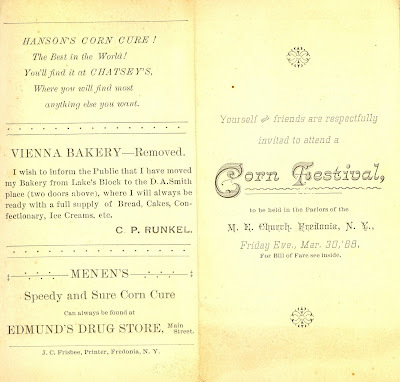 Estelle Woods Wilcox, The New Practical Housekeeping: A Compilation of New, Choice and Carefully Tested Recipes (1890) provides the traditional method for preparing hulled corn. In the new process, corn was kiln-dried to separate the hull from the grain and then loosened and removed by machinery.